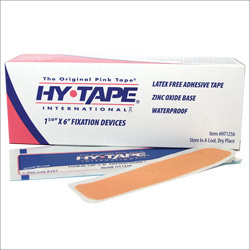 Hy-Tape Pre-Cut Strips are 1.25” x 6” pre-cut, single use tape strip to expedite any taping application. Great for anyone who has trouble pick starting a roll or for those who want the convenience of carrying a thin self contained strip of tape. The strips come in packs of 4. Each box contains 25 packs of 4 strips.